Mashenka is a 1942 Soviet drama film directed by Yuli Raizman and starring Valentina Karavayeva and Mikhail Kuznetsov. The Night Before Christmas is a 1951 Russian feature animated film directed by the "grandmothers of the Russian animation", Brumberg sisters, and produced by the Soyuzmultfilm studio in Moscow. The film is based on Nikolai Gogol's story The Night Before Christmas. In big degree it was succeeded to present in this screen version of the story of the same name on the screen national color of the Ukrainian village. Dream of a Cossack is a 1951 Soviet drama film directed by Yuli Raizman based on the novel The Golden Star Chavalier by Semyon Babayevsky. It was entered into the 1951 Cannes Film Festival. Nikolai(y) Nikolaevich Nosov was a Soviet children's literature writer, the author of a number of humorous short stories, a school novel, and the popular trilogy of fairy tale novels about the adventures of Dunno and his friends. Nikolai Getman, an artist, was born in 1917 in Kharkiv, Ukraine, and died at his home in Orel, Russia, in August 2004. He was a prisoner from 1946 to 1953 in forced labor camps in Siberia and Kolyma, where he survived as a result of his ability to sketch for the propaganda requirements of the authorities. He is remembered as one of few artists who has recorded the life of prisoners in the Gulag in the form of paintings. Nikolai Alekseyevich Slichenko is a Russian singer and chief director of the Romen Theatre in Moscow. He was the only Romani person to be awarded the title People's Artist of the USSR (1981). Nikolai Afanasyevich Kryuchkov was a Soviet film actor. He appeared in 94 films between 1932 and 1993. Nikolai Borisovich Kulikov was a Soviet footballer. Kulikov played for FC Pakhtakor Tashkent as a defender from 1976 to 1979, before he died in a mid-air plane crash in August 1979. He was classified as a Master of Sport of the USSR in 1979. Nikolai Efimovich Timkov was a Soviet Russian painter, Honored Artist of Russian Federation, and a member of the Saint Petersburg Union of Artists. He lived and worked in Leningrad and is regarded as one of the leading representatives of the Leningrad School of Painting, worldwide known for his landscape paintings. Nikolai Nikolaevich Baskakov was a Soviet, later Russian, painter, a member of the Saint Petersburg Union of Artists, who lived and worked in Leningrad, regarded as one of the leading representatives of the Leningrad school of painting, most famous for his genre and portrait painting. The year 1962 was marked by many events that left an imprint on the history of Soviet and Russian Fine Arts. The year 1978 was marked by many events that left an imprint on the history of Soviet and Russian Fine Arts. The year 1942 was marked by many events that left an imprint on the history of Soviet and Russian Fine Arts. The year 1930 was marked by many events that left an imprint on the history of Soviet and Russian Fine Arts. Nikolai Isaakovich Pastukhov was a Soviet and Russian actor. Nikolai Nikolaevich Rybnikov was a Soviet actor. He was awarded the honorary title People's Artist of the RSFSR (1981). Nikolay Arkadevich Skorobogatov was a Soviet film and theater actor. 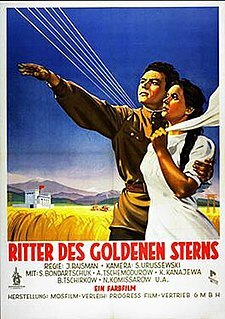 Farewell, America is a 1951 Soviet drama film directed by Aleksandr Dovzhenko. Nikolai Sergeyevich Lebedev is a Soviet and Russian theater and cinema actor. People's Artist of Russia (2018). Nikolai Nikolaevich Yeremenko Jr. (Belarusian: Мікалай Мікалаевіч Яроменка, was a Soviet and Russian theater and film actor, film director of Belarusian origin. He was awarded People's Artist of Russia in 1994. This article about a Ukrainian actor or actress is a stub. You can help Wikipedia by expanding it.